The reticulated python is possibly the biggest giant reptile in the world. The mighty reticulated python is native to Southeast Asia, and is the longest snake found in the wild, and an impressive sight to behold. Their true name is Python Reticulatus which is from latin origin and means ‘net-like’ which refers to the skin markings and patterning of the python. 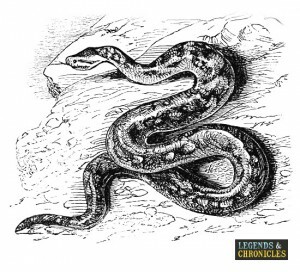 They are generally considered to be part of the larger genus Python family of creatures, but recent studies have shown they may be more closely related to the Broghammerus family. Traditionally friendly to humans, the reticulated python should not be thought of as a friendly giant though. While they are not considered dangerous, they are large enough to cause serious problems for a full grown human, even though these reportings are not common place. Many reticulated pythons will not reach the reported full size, with some full grown adults not growing longer than 6ft. Lengths of 10 to 15ft are still typical though in this truly giant reptile. In some cases though the reticulated python will become a literal giant. They can reportedly grow up to 30ft in length which awards them the title of the longest reptile and snake in existance, and there are many examples of the immense size of the Python Reticulatus. The reticulated python is of course named after is net like markings, which allow it to effectlively hide in its environment, providing cover amongst the foilage in the habitat the python the resides in. The skin colours and marking colours can vary widly depending on the subspecies of the reticulated python, typically matched to its environment to provide it the cover it requires to hunt and survive effectively. 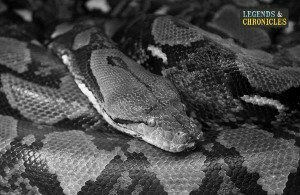 The most unique feature about this class of python is of course its immense size, and as we mentioned before, while the reticulated python is quite long in length, their bodies are normally slim, much slimmer than the often similary sized giant anaconda. The reticulated python like most reptiles is oviparous which means that it lays eggs rather than giving birth to a live baby. The reticulated python in particular typically lays a large amount of eggs, and the amount is usually in relation to the size of the female. It’s known that the female reticulated python can lay in excess of 100 eggs at a time, which she then lays and wraps her body around till they hatch the python babies. The female will spend around eighty to ninety days hatching the baby pythons during their incubation, and once they hatch, the young reticulated pythons are typically left to their own devices by their mother. The hatchlings are quite large, anything from twenty to fourty inches long and once they are free of their egg they are fully capable of hunting, eating and fending for themselves like the natural predators they are born to be. The full size of an adult reticulated python is impressive and scary. Definately in the running as one of the biggest giant reptiles still in existance today, the reticulated python is known to have reached a length of over thirty feet, and i believe the official recorded length is somewhere in the region of thirty three feet in length. 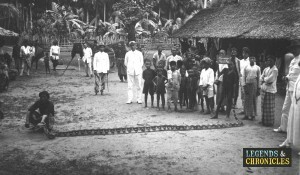 Of course, many people have estimated to see bigger reticulated pythons, with sightings of much larger snakes although many of these reports, sighting and captures remain unconfirmed for now. I woudld not be surprised if a fifty foot long reticulated python was found in the wild, although it would definately have to be in a habitat with a generously warm climate. The reticulated python like all pythons is carniverous, they eat large mammals like pigs, deers, chickens, ducks, monkeys and anything else they can wrap their powerfuly body around. Due to the immense size of the reticulated python, there is not much they will not consider for food, which considerably broadens its diet variety potential. As the reticulated python is not venemous, it typically prefers to ambush its prey when hunting. Once its prey appears within close range, the reticulated python will attack with its strong jaws, sinking its teeth into the prey, before wrestling and struggling to wrap its body around its subject. Once its prey is locked up the reticulated python will squeeze and squeeze, slowly drawing the life out of its victim. Often when the prey breathes out in a panic, the reticulated python will squeeze at this point, limiting the size of air in the lungs of its victim and bringing a quicker death. The digestion of the reticulated pythons prey can take a long time, the giant python like most snakes after a feed, will become much more lethargic and dosile. Its digestive system kicks in at this point, the reticulated python will produced digestive enzymes that will break down its recent prey and get the nutrients and food that the python needs. The reticulated python is found in a variety of countries and islands all located in Southeast Asia, including Thailand, India, Bangledesh and the Phillippines amoung others. The common element of all the countries is typically the warm, damp climate, that suits the reticulated python to perfection. Their natural habitat of the reticulated python is the rain forest, but they can also live in woodlands, scrubland and grasslands. As with many pythons the reticulated python is excellent in the water, and also likes to live in areas that have water nearby. Its swimming abilities is one of the reasons why the reticulated python lives on a variety of islands within its southeast asia boundaries. One of the largest reticulated pythons captured from the wild is apparently 49 ft long and weight in at 990lbs in weight. This occurred in Jarkarta, Indonesia and was confirmed by a local government offical but there was no offical record recorded. The largest reticulated python in captivity was recorded at 25 feet long, and was an 8 year old snake, known as Medusa. The Guiness World Records recorded the length, and apprantly Medusa is a friendly python who can actually purr like a feline. Often considered to be the biggest living snake in the world, the reticulated python is a true giant reptile. Long, heavy and a dangerous predator, the reticulated python is probably the longest living snake species in existance today and would more than likely grow larger if the earths climate was warmer.